With our module Multilingual Sitemap Plus you can quickly generate Sitemaps for your Prestashop site, we cover all versions: 1.4.X - 1.5.X - 1.6.X . 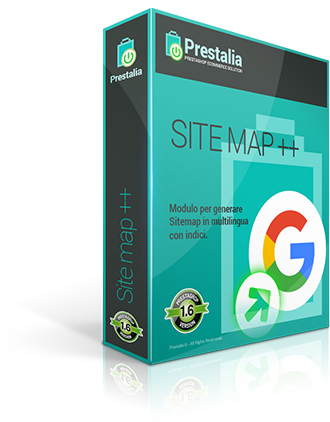 The module will create itself the index of every Sitemap based on: products, manufacturers, categories, suppliers and cms pages: they are the sitemap's index that you will send to Google Webmaster Tools. In this way you can obtain a rapid indexes of your ecommerce Prestashop site, that is very POWERFUL from a SEO point of view. You can also include the images of your products and the images of the products in specific categories. You can also specific HOW MANY urls and HOW MANY images you refencing in sitemaps. And for last, you can also specific the priority and the frequency of your sitemaps. The module works flawlessly and has really a low impact on CPU (also on big sites you can generates sitemaps very fast) so, this module will works like a charm without 'filling up' the resource of your server. Quickly generation of sitemaps index of: products, categories, manufacturers, suppliers, cms pages. You can specify the priority, the frequency and also the number of urls/images to include in every sitemap. Perfectly integrated in a multilingual environment: this module works with every languages of your Prestashop site, generating HREFLANG tag for your languages. Very fast generation of your sitemaps also on big Prestashop sites ( > 100.000 products) without loading the CPU.